Amidst the rumors, I wondered why a telecommunication giant would invest so much into a promotion and then print void cards which read ‘Try Again’. But I bought a Vodafone SIM for my modem, and started buying credits. To my surprise I realized that with a period of three weeks, I had been rewarded with 3 multiples 5ghc credits. It dawned on me that aside the expensive jokes graphic designers as well as other rivals telecommunication companies were sending out there, Vodafone really wanted to reward loyal customers with the ‘Yee Twi Kɔ’ promotion. My doubts were laid to rest after I read in the papers that Vodafone had rewarded 3 of their subscribers with 45,000 for accumulating the most points at the end of the first month of the ‘Yee Twi Kɔ’ promotion. 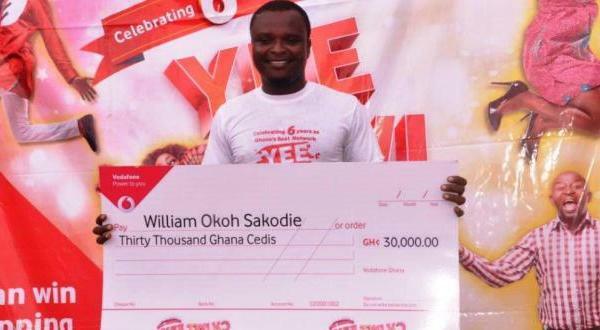 William Okoh Sarkodie, a businessman, won the monthly grand prize of GHC 30,000 while Mustapha Ahmed Toufiq and Eric Lumor took home GHC10,000 and GHC5,000 respectively. I concluded that like it happens on a football field, each team would do everything and anything possible to net the ball in their opponents post. I believe that aside all the smear campaign to destroy the good ‘Yee Twi Kɔ”’ promotion, Ghanaians and Vodafone customers would all be presented with the facts and truth. Truth, they said, cannot be kept under the stone forever.